Again, I was struggling, trying to decide what I would share with you--about me--that started with the Letter R. Hmmm...Reading? I love to read! Raspberries? Yum, they are starting to bloom and my mouth waters every time I think about eating those lush morsels! Red? That was my favorite color for the first 40+ years of my life then changed mysteriously to Lime Green! Last night I still didn't have a clear idea of what to write so just let it rest. Then this morning I was emailing the Stampin' Up! Retirement Lists to my customers and it hit...Retirement! Well, duh! This blog IS called Kat's Retirement Journey, right?!!! I have been retired for nearly 4 years now and retired early (age 56) because Fibromyalgia was making living and working difficult. My health and energy were dipping lower and lower and it became evident that working was NOT helping me have a good quality of life! The stress was literally killing me! So I retired! Unfortunately hubby was not able to (nor did he really want to) retire with me so my life in retirement looks pretty much like a Stay-at-Home Wife with a few side trips:) The perks of retirement are: I am able to travel with my hubby when he goes on business; stay longer at my daughter's when I go to visit; blog; spend more time crafting, cooking and reading! Hubby and I are also able to holiday a little more than my work vacation schedule used to allow. My life and environment are relatively stress free so the Fibromyalgia symptoms are more manageable; I am not taking pain medication and sleeping every spare moment! Are you retired or looking forward to retirement? Does retirement scare you just a little? What is the ONE thing you would like to do in retirement? 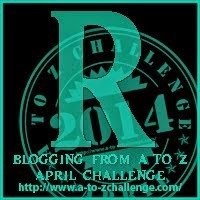 Labels: Blogging from A to Z April Challenge, Fibromyalgia, Retirement, Stampin' Up! It's definitely a benefit when you are in control of your life which in return allows you to manage your health better. I see how much my MIL struggles at her work and how stressful it is for her and only wish she would retire early and earn better money management to be able to afford it. I love reading and raspberries too. In retirement I hope to be doing the same thing I am doing now – writing and reading. :-) I have one daughter whom I wish would quit her overly stressful job (I quit one like it years ago) because life is too short. I'm your newest A to Z follower, and glad for it. I need to write more and read less, I think! Life is too short to spend it doing something you don't like! Welcome to my blog, Debi! Retirement for me is a long, long way off. Retirement is a gift that I am grateful for every day! Nice post! Good choice of word for R.
Hi Kathy I came to your blog as a fellow A to Z er, also recently retired. I find I am as busy as I ever was. I volunteer as an art gallery guide and there is a lot to learn about the wonderful paintings our gallery has. Being financially secure helps. I retired relatively early as the timing seemed right. I had enjoyed my job but it was time to move on with my life. We moved cities as well. I had lived in the same house all my life and I wanted to live somewhere different even thought it might have been a nice idea to continue. Retiring early is good:) Volunteering at the art gallery sounds great! Still stretching your mind while doing something fun! Oh, you were brave to move cities! I did that when I was younger but have lived in the same house for 20 years now. Thanks for stopping by on your A to Z journey!